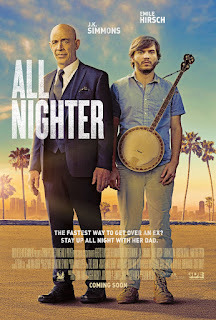 Enter to win an passes for ALL NIGHTER. CAST: J.K. Simmons, Emile Hirsch, Analeigh Tipton, Taran Killam, Kristen Schaal (LAST MAN STANDING). ALL NIGHTER is in Theaters on March 24th, 2017. Like our Facebook Page, Subscribe, and Comment below the location you want to win! Disclaimer: NO PURCHASE NECESSARY. ONE ENTRY PER PERSON. Must be 13 years of age or older to win passes. Employees of all promotional partners and their agencies are not eligible. Void where prohibited. Winners will be contacted via e-mail to receive their e-pass. Sponsors not responsible for incomplete, lost, late or misdirected entries or for failure to receive entries due to transmission or technical failures of any kind.